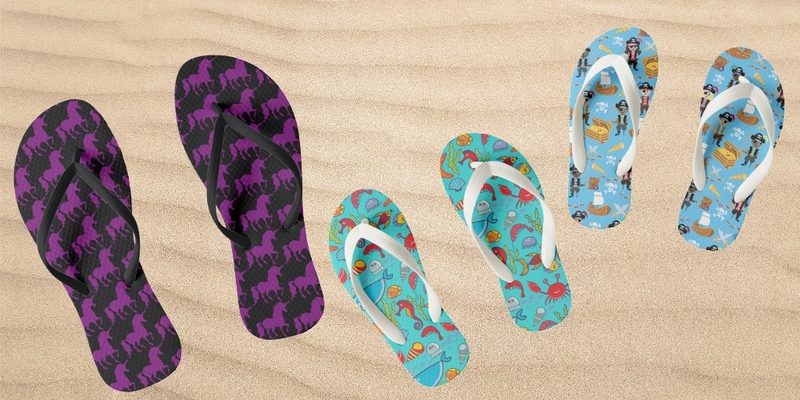 FLIP FLOPS: The beach is calling, and these flips flops are your answer! Pay ode to the summer and free your toes. Live, work and play with your feet exposed. Thong style, easy slip-on design made from 100% rubber makes sandals both heavyweight and durable. The cushioned footbed with textured rice pattern provides all-day comfort. These flip-flops are made in Brazil and printed in the USA. ZIPZ LOW TOPS & SLID ONS: Step out of the box in a pair of unique custom sneakers! Each pair of custom Low Top ZIPZ® Shoes is designed so you can change your style as often as you’d like to match any mood or occasion. A fresh look at sneakers for kids and adults, ZIPZ® shoes give you a one-of-a-kind way to express yourself!